I had no expectations when I came to Mallorca. I had planned the trip on a lark with an acquaintance who I met at a conference and who I barely knew. I have no impulse control when it comes to travel. All you have to do is say, “I want to go here. Do you want to go here?” Then I say “yes”, and we go (or, at least, I go, if you weren’t actually serious) because I can’t seem to help myself. When we arrived on the island, we had no itinerary and no researched list of what we wanted to do. I thought I had a vague idea of what it would be like because I had spent a week on Ibiza, but the two islands are very different, so I really knew nothing. The road trip itself was completely unplanned and happened only because we saw the car rental shop on the side of the road and thought it was a good idea. It turned out to be a very good idea, and because the road trip was so spontaneous, everything we came upon was a fabulous and wonderful surprise. To begin our Mallorca road trip in our POS rental car, we first headed out early along the coast from Santa Ponsa, west and then northeast (Ma-1 to Ma-10). It was near Estellencs in the Serra de Tramuntana that we met up with the coastline and began to understand the real beauty of the island. Michael Douglas has a house somewhere in the area, and I can’t imagine that he’s the only prominent name with a breathtaking view like that. 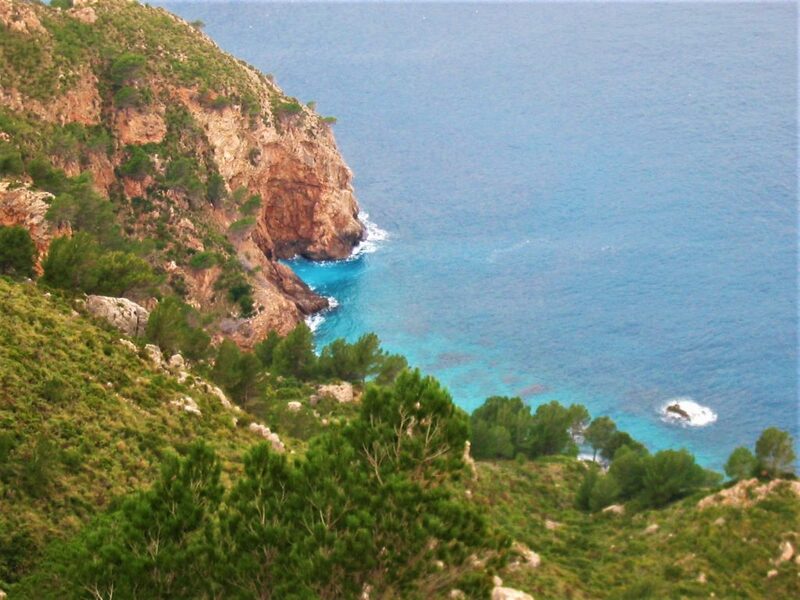 The Serra de Tramuntana mountain range is home to the highest peak in the Balearic Islands, the Puig Major, and extends along the northern coastal region of Mallorca. There was no one else on the mountain roads in the early morning, so it was easy to just stop and look over the cliffs, lush with vegetation, into the deep blue-green water. It was worth renting a car just for the scenic view. This section of the island is really not to be missed. Our first stop was Estellencs, a small village near the mountains that boasts a small cove and port with a 4-star hotel (Hotel Maristel). Unfortunately, there is no real beach to speak of. We didn’t see anyone else around at all, so I can imagine you’d score some great hotel deals in the off season (wishful thinking, maybe). The town itself is very small with only a few restaurants and a bar that all of the locals go to. I would love to come here and do nothing but lay out by the pool, drink wine, and have Spanish food for a week. The thought is so tempting. 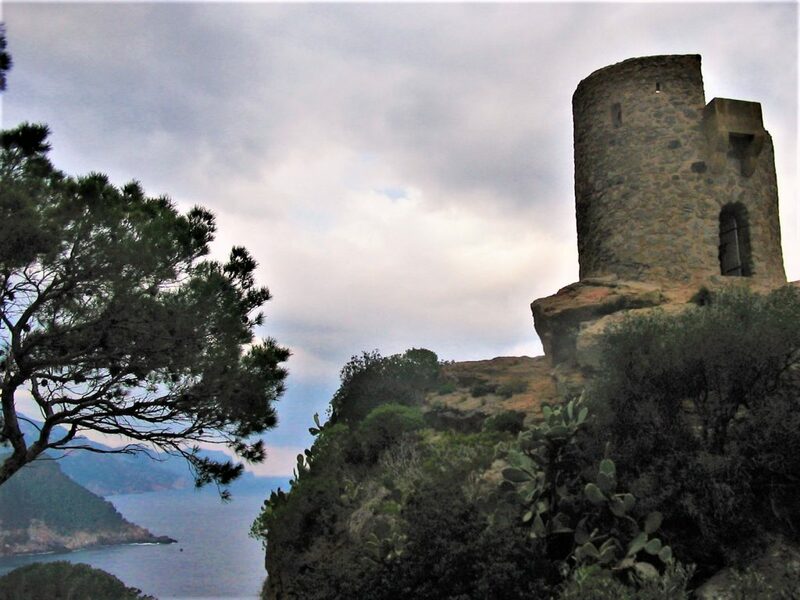 We moved on to Banyalbufar along Ma-10 where we were greeted by the Torre Ses Animes watchtower, which was built in the 16th century to protect the residents from pirates. This watchtower can be seen on many postcards around the island, although it is far from the only one. The town of Banyalbufar is slightly larger than Estellencs (~500 residents as opposed to ~300) and offers a bit more in the way of hospitality and beaches. The village was also once known for its Malvasian wine, but unfortunately, the vineyards were devastated by a virus in the 1800s. Banyalbufar does have beaches, unlike Estellencs, coves where you can swim, and walking paths, making it an even better getaway spot. Deià is one of the most popular towns in the Serra de Tramuntana, but we only drove through without stopping, despite the picturesque dwellings hugging the landscape. My acquaintance had assured me that he could drive stick when we rented the car, but as it turned out, that wasn’t completely accurate. We stalled out on a tiny village road, blocking both directions, with frustrated farmers honking at us, so we left very quickly once we got the car running again. 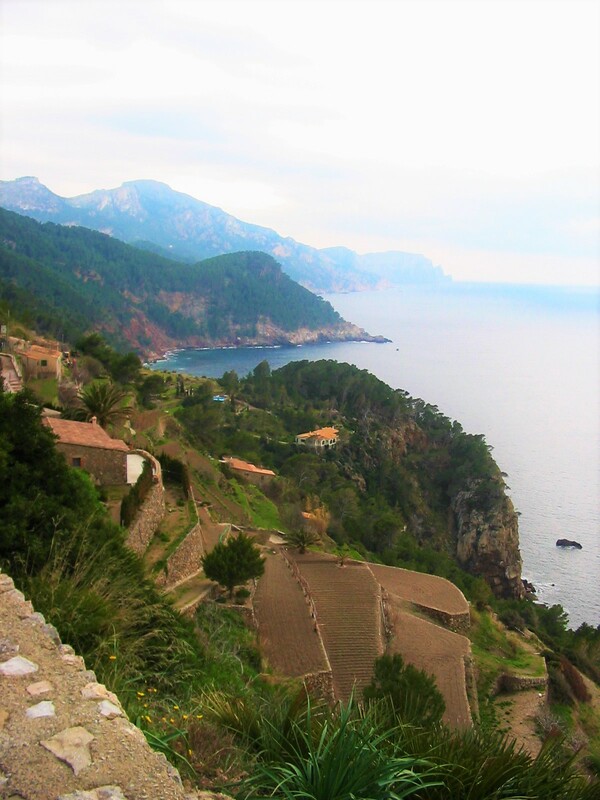 Deià has been home to well-known foreigners, most famously the author Robert Graves, and has been visited by many prominent artists and writers, including Mick Jagger and Anaïs Nin, so I’d love to go back and give it the time it deserves. The Serra de Tramuntana was by far my favorite region in Mallorca, but renting a car or even biking is a must to get around. I would love to come back to this part of the mountain range for an extended period of time and enjoy the beaches and the many places to hike in the area. When I think of Mallorca now, I think of the cliffs and the sea that we saw here rather than clubs and partying, and that’s such a good thing.